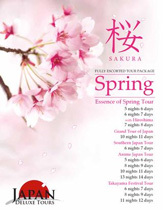 During this Japan tour we got to see many places with beautiful sakura cherry blossoms. Cherry Blossoms were Beautiful on our Japan Tour. It should have been nice to pass by any park. Need more time to explore sights. Itinerary was nice but there were some areas without cherry blossoms.